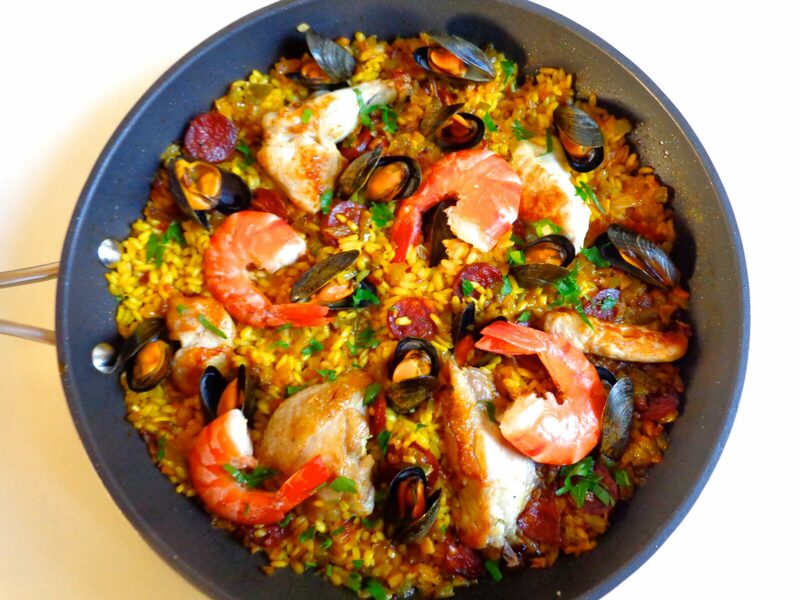 Paella, almost as popular in France as it is in Spain, is not difficult to prepare but there are various stages involved, so you will need to take your time. In this recipe, the chicken, mussels and shrimp are cooked separately and set aside before preparation of the sofrito — onions, green pepper and garlic sautéd until they are meltingly tender — and then the saffron-flavored rice. Everything is combined at the end. Prepare for applause. For best results, use a round, short grain variety of rice. It doesn’t have to be from Spain. I have found that Italian risotto rice, readily available in France, works just as well, and other short-grain varieties may be available elsewhere. If possible, have your butcher chop the chicken into about 12 small pieces. You can also do this at home with a strong knife or a meat cleaver. I prefer to use chicken with the bone in, but an easy substitute would be boned chicken breasts (two large breasts for four people). If you don’t have homemade chicken broth on hand, you can start an hour early and use the wings from your chicken to make the broth. This recipe serves four, but it can easily be halved if you are cooking for just two people. Chop the chicken into small pieces. Heat 1 tbsp. olive oil in a skillet. Sauté the chicken until it is golden brown on all sides, about 15 minutes. It should be almost but not entirely cooked through. Transfer the chicken to a bowl with its juices and set aside. While the chicken is cooking, rinse the mussels and remove the beards (seaweed-like threads). Heat 1/3 cup white wine in a large pot. Add the mussels, cover and cook over high heat just until the mussels open, about 3 minutes. Transfer the mussels to a bowl with their juices and set aside. Sauté the shrimp in 1 tbsp. olive oil. If starting with raw shrimp, sauté until they turn pink. If starting with pre-cooked shrimp, sauté until the shells brown slightly. Set aside. Peel and finely mince the onion. Rinse the green pepper, remove the core and mince finely. Peel and mince the garlic. Remove the skin from the chorizo and slice finely. Heat the remaining 3 tbsp. olive oil to sizzling in a large skillet or, if you have one, a paella pan. Add the onions and pepper. Turn down the heat to medium and sauté, stirring occasionally, for about 10 minutes. Add the garlic and continue cooking for another 5 minutes. Add the chorizo slices and cook for 5 minutes more. Add the rice to the skillet and sauté until translucent, about 3 minutes. Add the remaining 1/3 cup white wine. Allow the wine to evaporate, about 2 minutes. Now add the broth or water. Add the saffron, salt and pepper. When the liquid comes to a boil, turn the heat down as low as possible and cover the skillet. (If you don’t have a cover for the skillet, not to worry. It doesn’t make a huge difference). Important: do not disturb the rice while it is cooking. Allow the rice to cook for about 10 minutes. Remove the cover and taste. When it is just barely al dente — still a little crunchy in the center — arrange the chicken pieces, mussels and shrimp on top and press them gently into the rice. Add their juices to the skillet. Cover and allow to cook over low heat for 5 minutes more. Sprinkle with the fresh parsley just before serving. Serves 4 generously.